Medical malpractice is a form of professional negligence by a doctor, nurse, or another healthcare provider, that causes an injury. These lapses in the application of medical treatment cause catastrophic injuries including death. Medical malpractice victims encompass a wide spectrum of areas including medical malpractice, dental malpractice, nursing home negligence and hospital negligence. Baseluos Law Firm attempts to secure recoveries that allow victims to obtain the care and facilities needed to improve their potential and ensure that they are taken care of for the rest of his life. Commission: Negligence occurs when the wrong procedure is performed, such as operating on the incorrect body part or executing an unneeded surgery. Omission: Negligence occurs when a surgical team fails to furnish a patient with the necessary care. Execution: This is a form of medical malpractice in which a surgical procedure is not correctly executed. Other errors include using unsterile equipment, placing an instrument inside the body of a patient, incorrectly giving anesthesia, and failure to inform a patient of potential risks and dangers. Oftentimes, surgical mistakes occur during childbirth, gastric bypass, cardiac surgeries, thoracic surgeries, and cosmetic surgeries. However, a surgical error can occur in any type of surgery. A lawsuit seeks to compensate a victim for the mental and physical anguish, known as "Pain and suffering". BLF uses experts to really demonstrate to a jury the functional limitations as a result of injury and the impact on that person's ability to enjoy life. Non-economic damages, in medical malpractice actions, are limited to a total of $250,000 from all individuals, including doctors. Non-economic damages against institutions are limited to $250,000 from each institution or hospital with a total of $500,000. The cap applies to each claimant seeking damages due to a person's injury or death. Damages for wrongful death medical malpractice actions, both economic and non-economic, are limited to $1,650,000 (in 2007 dollars) in addition to any necessary medical or custodial care costs. The cap is adjusted annually for inflation. Baseluos Law Firm handles cases of spinal cord injuries, brain injuries, amputations, burns, and birth injuries, among other types of medical negligence. 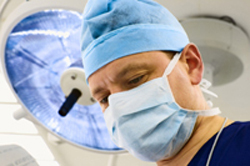 Get a free legal review of your potential medical malpractice case. Contact the Baseluos Law Firm today to discuss your legal options. Matter Information: What medical procedure were you having done? We serve the following localities: Bexar County, San Antonio, Dallas County, Dallas, Irving, Mesquite, Tarrant County, Arlington, Fort Worth, Harris County, Bell County, Killeen, Collins County, Plano, Galveston County, Galveston, Hays County, San Marcos, Travis County, Austin, Hidalgo County, McAllen, Mission, Lubbock County, Lubbock, Nueces County, Corpus Christi, and Houston.